Big companies don’t think it twice: the wider their audience, the higher their profits. In this context, when they want to carve out a market niche worldwide, English is not enough. What is missing here, as far as businesses are concerned, is serious attention to multilingual needs in customer support. Multilingual chatbots are a gold opportunity to reach them all. 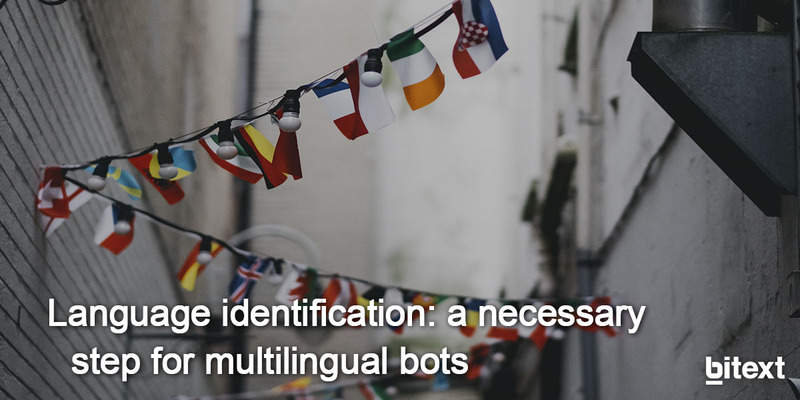 When talking about multilingual bots, it is important to differentiate between language understanding and language identification. Everyone knows that a bot can be trained to understand any language and this never-ending task become even more complex than usual depending on the language the bot must learn. Despite this, an important part to keep in mind when building multilingual bots is, first of all, identifying the language spoken by the user as soon as possible. Here it is crucial to have a language detection tool at disposal to recognize the different languages in which customers can interact with the chatbot. Multilingual bots. These bots are those who not only identify the language every user is speaking, but they are also smart enough to give the right answer in the right language. That is, undoubtedly, quite useful for those multinationals that have an international market since their customers come from all over the world and need someone to attend them around the clock in every time zone. A good illustration of a multilingual conversational agent can be Siri from Apple that currently supports up to 20 languages. Monolingual bots. In case a bot is still not trained enough to hold a conversation in different languages, it must be able to recognize, at least, that the user is speaking in other language and identify which one is. With a language detection tool, the bot could answer back something like “Sorry, I can’t speak your language yet, but my colleagues are working on it” as the virtual assistant of the Bank of America, Erica, is already doing. Language mixing. Some people are used to mix two different languages when speaking. A great example of this kind may be Spanglish, a blend of English and Spanish terms especially spoken in the United States. In such cases, a language detection tool will check the number of words in a sentence written in a language or another becoming the language with a higher number of words the primary language for the interaction. With the help of a system for word-level identification of mixed-language texts, a bot will be able to identify them and switch languages right away. Word and Outlook on Windows, for instance, detect the language that you are typing and automatically enable the proofing tools for that language. Are your clients after a bot with a good conversational ability able to understand multiples languages? You must then look for a NLP expert team. While having a bot trained to understand many different languages becomes a cornerstone for international companies, there is also room for another key element helping them, in the meanwhile, solve further language issues. Bitext language identification tool, intelligent enough to recognize up to 50 languages including Spanish and Hindi, is certainly a quick fix to reach more people in less time. Leap at the chance and try it in our api tool! The more languages a bot can understand, the more clients will come to you.